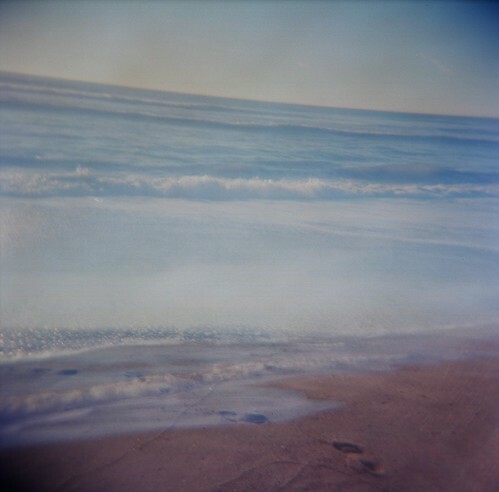 Here is a few dreamy Holga picturs from my jaunt down the California coast... I love driving on highway 1. I am very happy with the way these three images came out. They look very much like the beach in winter with all the cold blue colors and like fog because of the slightly out of focus subjects. I have become very attached to this little plastic camera. Hurray for film! I think I may print and frame the first image as a little 6X6 square and put it next to my bed. That way while I fall asleep I can look at it and then dream of the ocean. That idea is very calming to me for some reason. Posted in "120", "Lev B", "Nick D", "holga"